In my experience, horses and mules are much more at ease on a horse highline than tied to a hitch-rail or, even worse, a tree. A highline offers them the opportunity to walk around in a circle, lie down and even roll. What is a Horse Highline? A highline is simply a length of rope stretched between two trees to which you have tied your stock. Included in any highline kit should also be a pair of Tree Saver Straps. Most areas, especially wilderness areas, are requiring the use of tree saver straps around the trees to prevent them from being girdled by highline ropes. Additionally, to make them easier to use, our TrailMax™ Highline Kits include the Original TrailMax® In-Line Swivel. This offers a quick, easily installed tie up spot for each animal and the In-Line Swivel ensures that the load rope will not get twisted up tightly or completely unraveled. To set up a horse highline, wrap a pair of Tree Savers around the tree as high up as you can reach, ideally 7-8' off the ground. String the rope through the tree savers and loop the Knot Eliminators or In-Line Swivels through the rope. Now tighten the rope. The rope will most likely need to be tightened once more in a couple of hours. Leave approximately 12 feet between each animal or whatever distance needed to keep the animals from getting tangled up amongst themselves. Never use a dead tree to set up a highline. Make sure the ground is clear of any debris that could injure your stock if they lay down or choose to roll. Most wilderness managers say to set up your horse highline on hard packed soil or rocky ground to prevent excessive scarring. Needless to say, not every campsite will be equipped with such a spot. In those cases, use your common sense. Choose an area outside of camp where the highline will do the least damage. Drier ground will survive better than wet ground. 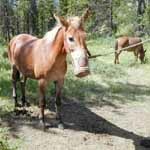 Before leaving the campsite, be sure to fill in any pawed holes, spread the piles of manure and, if possible, spread some cover over the ground scar of the horse highline to assist in regrowth. Some wilderness managers advise moving the horse highline every few days to prevent scarring, but I find that in some areas, this only results in multiple scars in every camp site. When I'm in camp and can keep an eye on them, I'll give my stock enough lead rope to get their heads to the ground, especially if I am feeding hay. At night, or when I leave them unattended, I shorten the leads enough to prevent them from being able to get a leg over the rope. If you are feeding grain or hay cubes from a feedbag, you can leave your stock tied to the horse highline and still fit the feedbag over their heads. 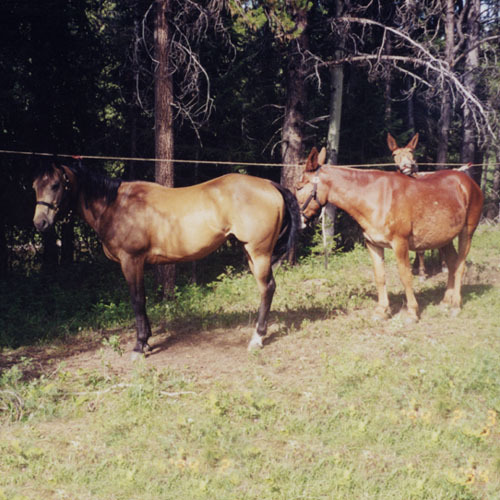 Horse highlines are the simplest, lightweight solution to containing your horses and mules in the backcountry and, when done correctly and responsibly, leave very little evidence that you have been there.